I’ve seen the Myers Briggs personality test applied to characters from favorite movies: Lord of the Rings, Harry Potter, etc. I figured there should be one for my favorite story of the past few years. 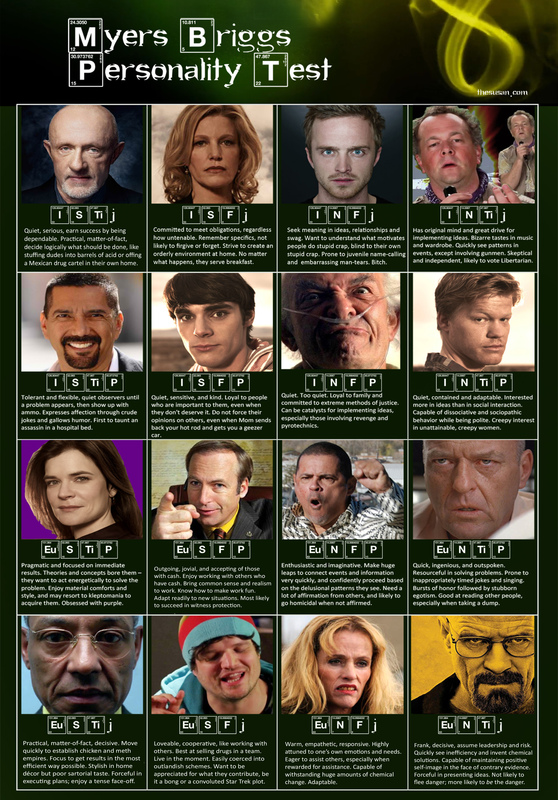 So here it is, ladies and gentlemen: Myers Briggs Personality Test á la Breaking Bad. Lord help me. I’m the bell-dinging crazy uncle. What are you, Susie-Q? I’m an ENFJ /P. Wendy or Tuco! Ha! Yes I figure her for an E/ISTJ?? Very inaccurate have you ever even watched Breaking Bad? I’m a BB fanatic. This is a humor piece, not meant to be taken literally. Just finished reading Angry Convos and I KNEW we were kindred spirits from the first page. But now your interest in Myers Briggs totally confirms it! Can we be best friends? Also, I guarantee you that you’re an ENFP rather than an ENFJ. I’d bet money on that, if I had any. I also went through a confusing time when I doubted my ENFP-ness (don’t read that out loud) due to the fact I’m Queen of All Organization and Neatness. That means I’m a J, right? Not necessarily! When an ENFP matures, she starts to develop her tertiary Extraverted Thinking– the cognitive function responsible for organization and contingency planning. You can also read up on the differences between the cognitive functions Fi and Fe to see which one you use. Fe types like ENFJ are great at fitting in, while Fi types like ENFP often find themselves being the black sheep. Speaking of black sheep, thank you for writing Angry Convos. I’ve been the Christian black sheep all my life, and your book made me feel a little less alone. P.S. Apologies for going all fangirl on you. P.P.S. Just kidding, not sorry. You’re the best! Anna! I am so sorry I missed your post until now. I was busy at school. Thank you for your kind words about Angry Conversations! And THANK YOU! My husband insists I’m a J. But I’ve existed all my life in a P world. However, I really do get some kind of high from organizing things and being neat. When the world gets really crazy, then I go into organize and clean mode. Can I still be a P? I really want to be a P. I need to read more on Myers Briggs. I’ve never heard of the Fe / Fi terms. please tell me there’s hope for me, that I can be a P! These are so inaccurate it infuriates me, even if it is meant to be a “humour” piece. Walter is actually INTJ/P, as that makes sense. I think that fact is also a well known fact about Walter as well. If he was E type, he wouldn’t have sat around alone all the time or keep things secret. As an INTP, that description of an INTP is extremely offensive and retarded and doesn’t make any sense. For the character, maybe, but for INTPs, no. .
Shouldn’t Marie be an F type as she is more concerned about the feelings of others, and I always saw Hank as ESTJ/P. Skyler doesn’t seem like an F type since she avoids situations and would rather sit alone than talk about it. Saul is ESTP definitely, no questions. He is the classic ESTP classic shady lawer type. I absolutely adored Breaking Bad. I’ve seen Myers Briggs posters for Lord of the Rings, Disney characters, and they just seemed silly to me — as if you could assign a MB personality to an Orc. I made this one night as a wink to the other silly posters of the like. It was not meant to be point-point accurate or used in any serious study of Myers Briggs or Breaking Bad, so I am sorry that it angers you. You seem very committed to the Myers Briggs and to the show. I’d be interested to see you do a poster of the same. When I was making it I figured that there were many MB repetitions within the main characters. Thanks. But really Idk how accurate this is. For instance, I always thought of Gale as INTP . And Isn’t Walt way more introverted thsn extro? I did it as a joke, really. Gale seemed gregarious, though. He liked to be around people. He’s definitely an N. Maybe he’s an F, feeler? I guess Walt was an I, but did he become more of an E? Anyway, it was all in fun. I’m sure most of them are all clustered around just a few of the personality types. Thanks for your comment, though! Looking at these, actually it seems you are off on most of these. Tho , I admit that I am no expert on this. It was done as a prank in fun. I’m sure it’s off all over the place. However, “P” is for perceiving and “J” is for judging — not being judgmental. P’s thrive without structure, J’s thrive with structure. Maybe Hank is a J with his rocks; he sure didn’t handle that long recovery very well. His job was very unstructured; he had to go into any circumstance. But anyway, I made it in fun in reaction to these silly Lord of the Rings/Myers Briggs tests that were floating around. I thought it would be a fun prank to do one for Breaking Bad, which I think is the best show ever. This is absolutely the most inaccurate MBTI chart I’ve ever seen in my life. Walter and Gus are INTJ, Jesse is ISFP, Tuco is ESTP, Gale is INTP, Saul is ESTP or ENTP, Badger is ENTP, Hank is ESTJ, Marie is ESFJ, Todd is ISTP. Wendy is a crack whore, not a developed character. I’m unsure about Hector but he sure as hell isn’t INFP. The only ones that might be right here are Mike (ISFJ), Skyler (ISFJ), Walt Jr. (ISFP), Gomez (ISTP). I made this as a prank in response to the silly Lord of the Rings/Myers Briggs personality test that was going around the web. I’m sure it’s wrong in many places. It was made in good fun. But if you have any suggestions on how to fill in the missing types, I’d love to hear. Currently watching Breaking Bad and as an ENTJ, totally saw Walt coming. However, I feel strongly that Skylar is an ESTJ as my best friend of 40+ years is an ESTJ and I know one when I see one. Devil is in the details aka micromanaging. He reminds me so much of my son who is such. Hank is spot on as is Saul. I, personally, have identified with Walt since season One. I might argue he is INTJ, which Gayle is clearly not, but I too have introverted moments and his enebriated episodes clearly defines his ego. Gus is the INTJ in this show.